My position paper written for the Dutch Parliament Foreign Affairs committee hearing of Jan 22 (see my previous post) has a strong focus on infra-red detections of a missile by SBIRS. There are however a few other relevant aspects of Space Based observations in connection to the MH17 disaster that I could not cover in the space available to me for that paper. 2) the positions of SIGINT satellites. Both (unclassified) commercial and (classified) military satellite systems for high-resolution optical imagery (Image Intelligence, IMINT) exist, and both sources will be discussed below. Optical and radar imagery obtained in the hours before, as well as during the event, might be used to look for missile systems, both on the Ukrainian as well as separatist sides of the front, in a wide circle around the site of the shootdown. It could also be used to verify the reconstruction of the purported movements of a Russian BUK system published by citizen journalist team Bellingcat, a study which is not uncontested. The Bellingcat team places the BUK in certain places at certain times, and if space-based imagery (either military or commercial) for those locations and times exist they could perhaps verify these claims. The US military has one classified system of optical satellites with a (much-) better-than-1-meter capability: the KH-11 IMPROVED CRYSTAL/Evolved Enhanced CRYSTAL (aka 'Keyhole' or 'KENNAN') which reportedly (and theoretically, from known 2.4 meter mirror size specs) have a resolution in the order of 10-20 cm. Mid-2014 this system consisted of four satellites: USA 161, USA 186, USA 224 and USA 245. All of these have been discussed on this blog before and are tracked by our amateur network. We have accurate tracking data on three of these, USA 161, USA 224 and USA 245 for the days around 17 July 2014 and hence can pinpoint when these potentially had the crash area in their sight to better than a minute. For USA 186, which was actively manoeuvering around that time and for which we have a gap in our coverage form June to August 2014, pass times are a bit less certain and constrained to about 20-30 minutes accuracy. 4. there is the question of whether USA 161 was still operational at that time. It was the oldest of the on-orbit KH-11, being launched 14 years earlier. Only a few months later it was de-orbitted, so it was clearly at the end of its lifetime. In addition to their KH-11 system, the US military hires space on commercial high resolution optical IMINT satellites from the US commercial firm Digitalglobe (the same firm that supplies Google Earth with satellite imagery). Digitalglobe operates a number of satellites with a better-than-1-meter capability: Geoeye-1 (0.4 meter resolution), and Worldview 1, 2 and 3 (0.25-0.50 meter resolution). Most of the satellite imagery that the US Department of Defense supplies to the press (when briefing on the military situation in e.g. North Korea, Syria and Libya) comes from these commercial satellites. Imagery from these same Digitalglobe satellites is also available commercially, to any interested party with money. And in addition to DigitalGlobe, the European company Airbus Defense and Space also offers commercial high-resolution optical imagery from its SPOT and Pléiades satellites. Pléiades 1A and 1B offer a 0.5 meter resolution. SPOT 5 and 6 offer a 2.5-1.5 meter resolution. Accurate orbital data from non-classified sources are available for all the commercial imagers for 17 July 2014. 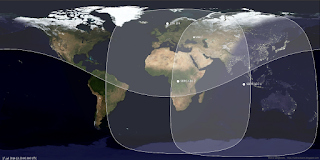 The satellites in question made several daylight passes over the area in the morning of July 17, 2014, between 8:00 and 10:00 GMT, i.e. during the 3 to 5 hours before the shootdown, a period when the skies were still less clouded. This does not mean that they necessarily made imagery of course. Yet any imagery these commercial Digitalglobe and Airbus satellites did make on July 16, 17 and 18 have the advantage that they are not "classified", unlike the US military data, meaning that they could be used and published without diplomatic problems by the Dutch government in the Dutch criminal investigation into the disaster. I would therefore expect the Dutch OM to either buy or subpoena all potential Digitalglobe and Airbus imagery from these dates. They can be used to reconstruct missile system positions in the area (both on the Ukrainian, the separatist and Russian sides) within range of the shootdown location, and they can be used to hunt for missile transports (see my earlier remarks about the Bellingcat claims). The Dutch Air Force has an imagery analysis unit that is well suited to help with such an analysis. Including imagery from the days before and after the incident as well is useful to look for differences between imagery of these respective dates. 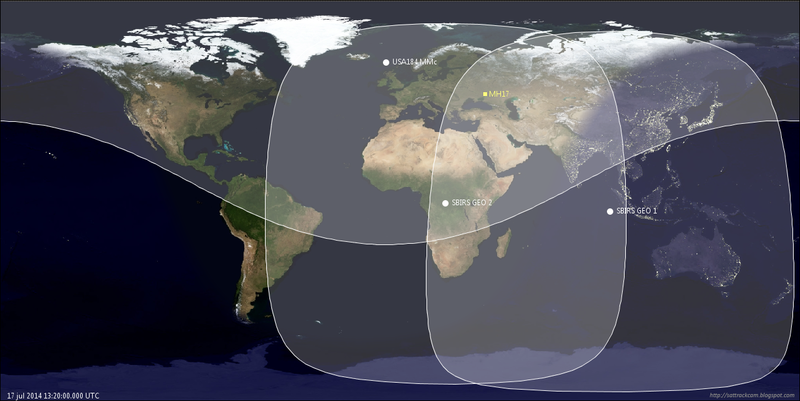 The US military has two systems for high resolution radar IMINT: the Lacrosse (ONYX) system of which currently only one satellite, Lacrosse 5 (2005-016A) is left on-orbit, and the radar component of the Future Imagery Architecture (known as TOPAZ), consisting of three satellites: FIA Radar 1, 2 and 3 (2010-046A, 2012-014A and 2013-072A). These systems should be capable of providing imagery with sub-meter resolutions, and like optical imagery, they can be used to look for the presence of missile systems in the area. They have the added bonus that they are not hampered by cloud cover, unlike optical imagery. Apart from the USA, the German military also operates a radar satellite system, the SAR-Lupe satellites. The French military likewise operates its own radar satellite system, the Hélios system. Japan operates the IGS system (which includes both optical and radar satellite versions). All of these satellites made passes over the Ukraine at one time or another on July 17 2014, so all of them might have provided useful imagery. FIA Radar 3 made a pass right over the area in question near 11:43 UT for example, some 1.5 hours before the tragedy. 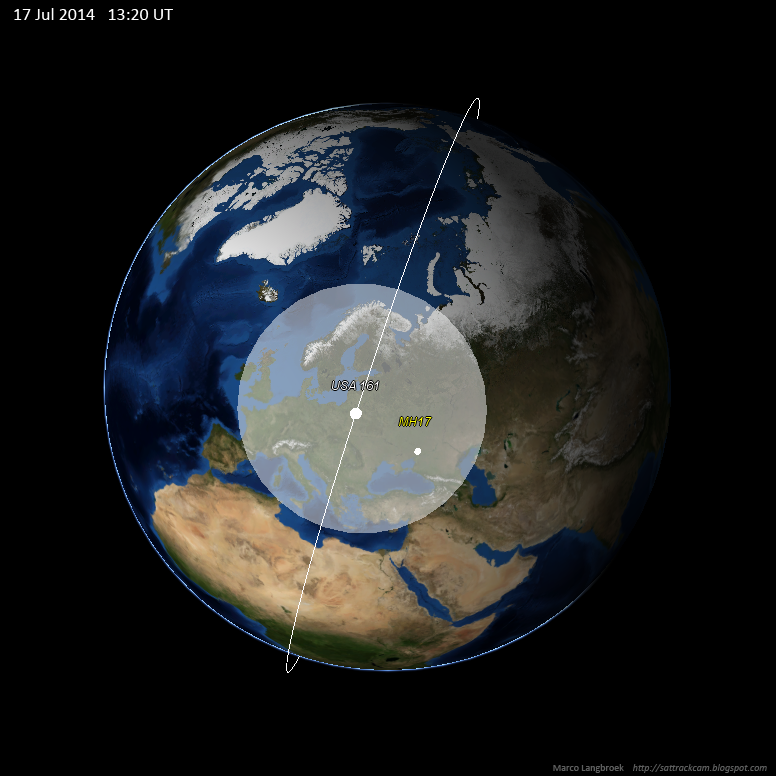 FIA Radar 2 made a pass over the area at 18:00 UT, 4.5 hours after the shootdown. These are just a few examples. Given what was happening in the area around this time, and the strong concern of NATO and the EU about this, it is almost certain that imagery of the area was collected by these US, German and French satellite systems. My position paper briefly mentions that a number of countries have space-based SIGINT (Signals Intelligence) capacities. This does not only concern capacities for (for example) the NSA to tap into your cellphone and satellite telephone conversations: another important strategic aspect of space-based SIGINT is the capacity to detect radar and telemetry signals from enemy weapons systems. Such detections allow identification of the used weapons system (each system has its own 'signature'). They also allow, according to remarks by the then NRO director Bruce Carlson in a speech from September 2010 at the National Space Symposium, geolocation of the source of this radar signal (in the case of MH17: geolocation of the Target Acquisition Radar of the launch unit). The US military has a number of SIGINT systems in several types of orbits: Low Earth Orbit (LEO) below 1500 km which allows coverage of a few minutes during a pass over a target; and Highly Elliptical Orbit (HEO) and geosynchronous orbit (GEO), which allow to monitor targets for many hours (HEO) to continuously (GEO) from distances of 36 000+ km. 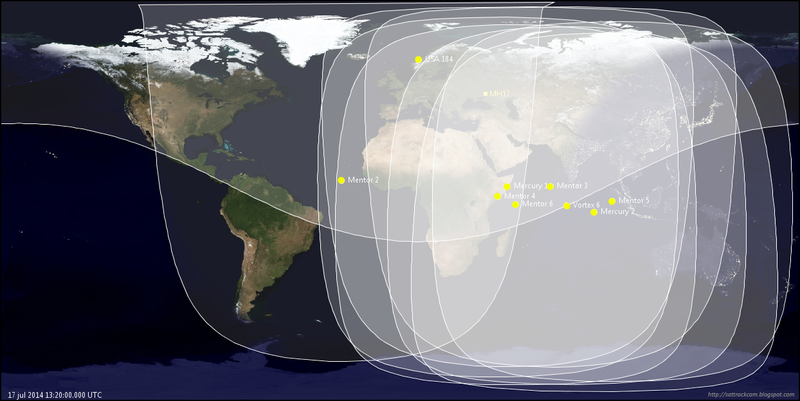 France has a number of SIGINT satellites in LEO. China no doubt has SIGINT satellites too, as does Russia. For the moment I will focus on the US systems. 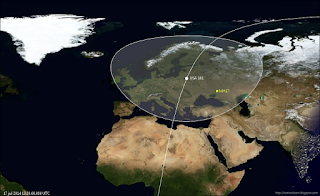 I must ad that I did check the French systems as well but none of the French systems (ESSAIM and Elisa, both in LEO) had sight of the Ukraine at that time. The US systems, under the catch-all codename ORION, include the TRUMPET-FO which move in HEO. One of them is USA 184, mentioned before in the discussion of SBIRS as it has a piggyback SBIRS capacity in addition to its main SIGINT role. There are also the big MENTOR satellites in GEO, plus two MERCURY satellites also in GEO, and the older VORTEX system. Of these systems, TRUMPET-FO, MENTOR and MERCURY are certainly still active based on their orbital behaviour. Again: this does NOT necessarily mean that all of these satellites were actively monitoring the Ukraine at that time. Quite a number of them will have been tasked on the Middle East. Yet, given the strong NATO interest in events in the Ukraine at that time, notably the rising concern about advanced surface-to-air missile systems following the shootdown of a Ukrainian Antonov-26 a few days earlier, I would be surprised if none of them monitored the Ukraine at all. I should point out here that there is some leeway in the exact position of USA 184, depending on whether it made a corrective manoeuvre to maintain its Mean Motion of about 2.00615 revolutions/day or not since the day we last observed it. Let me be clear: this does NOT influence the conclusions of my position paper: the MH17 crash site in both variants is well within the field of view as seen from USA 184, i.e. the satellite could potentially provide both Infra-red and SIGINT detections. In the interest of accuracy, I thought I should however mention it here. Acknowledgement - I thank Mike McCants (USA) and Ted Molczan (Canada) for discussions about satellite positions, notably concerning USA 184.